Thanks for writing Anonymous, and I’m really sorry to hear about all the troubles you’re going through at the moment, some people just can’t seem to get a break. While I can’t help you with any of your problems, I can help you with your actual question. I’m not sure if you read my blog from last month, but my wife and I went on an outrageously good holiday where we went all over Europe and then followed the Danube on our bicycles for about 400km. It was the best trip I’ve ever been on. At one particularly happy point I turned to my incredibly beautiful other half, gave her a smile and said “You know, I could do this forever”. We were on a slight downhill, so I knew she would take it well, but while I was expecting a “me too” type of answer, she was a little more realistic. “Well of course Mr obvious, I’m sure everyone would like to be on holiday every day, but people have to work”. She’s right as usual, but only up to a point. You see if you manage to save and invest enough, you will eventually reach a point where your investments grow faster than your typical spending. This is called being financially independent, or FI for short. Now if you can reach that point while still being younger than the normal retirement age, you will be retired early, or RE. Putting it all together by saving enough and then stopping working, means you have reached FIRE. This is the point where you can go on holiday forever, and in my case, spend at least a few years discovering the world by planes, trains, bicycles and boats. I can’t wait! Now when I mention these plans to people I know, I get a lot of blank stares. Then there are generally two types of responses. The majority of people think that it’s absolutely impossible that you could save enough, which as you’ll soon see isn’t the truth at all. The rest of the people seem to think it would be so boring not to have to work everyday, and that they’d have no idea what to do with their time. It must be terrible not having anything else you’d like to do except work. I don’t have that problem, I could quite happily fill a few decades with interesting things to keep me busy. But how do you know when you’ve saved up enough to reach FI? Well firstly ignore all those idiotic so called financial advisers telling you weird things about how you need to be able to a) replace 75% of your final salary, or b) how you can buy some magical annuity that will pay you gazzilions of Rands when you do finally retire. They’re a) completely wrong, and b) lying through their teeth. Income is actually totally irrelevant when it comes to being FIREd. There are in fact only two things you need to know when you want to find out how much you need. The first thing is how much you spend in a typical month, and the second is the number 300. Multiply those together and you get the amount you need to have saved up to retire happily and safely. Yes it really is that simple. As I’ve mentioned before, you can safely assume to spend 4% of your net worth every year and never ever run out. In fact, you’ll probably die far richer than when you retired. Now 4% is equal to 25 X yearly spending, which is also equal to 300 X monthly spending. It’s not really magic, it’s grade three mathematics. 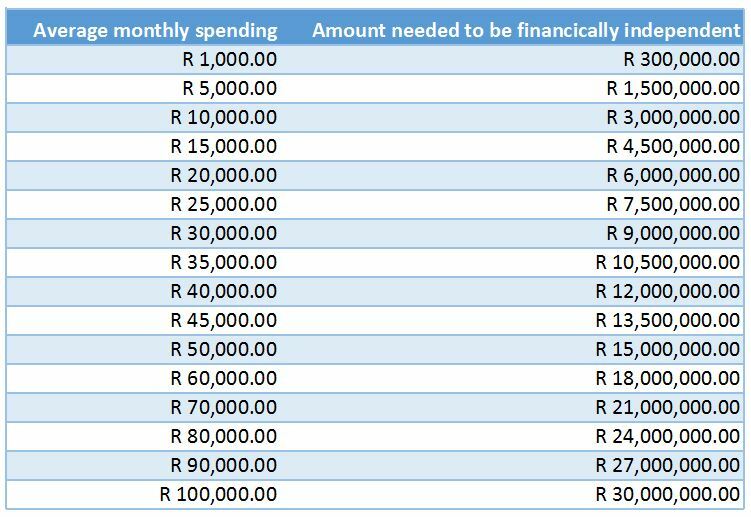 As you can see, if you spend just R1000 a month, you’d need only R300 000 to retire. 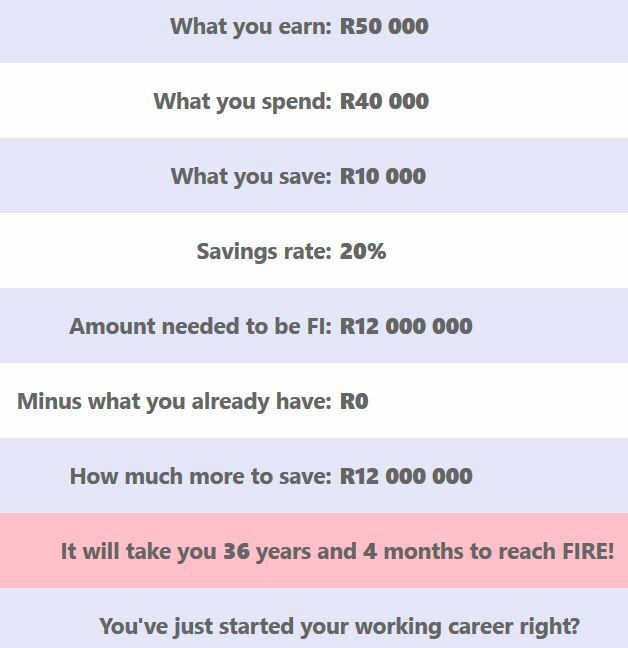 That’s not really realistic though, so let’s look at the example of Joe and Jane Average, a 30 year old working couple who spend on average around R40 000 a month. According to the table above they need to save R12 million to retire and keep up those standards. As if often the case, the Averages spend all their income, every month. This means they save zero rand, and also that they will never ever be able to stop working. 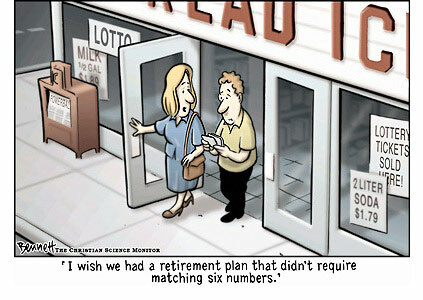 Their retirement plan currently consists of death. R12 million is a very big and scary number, but they shouldn’t stress too much because being financially independent at a relatively young age is something they can achieve with a little effort. All of a sudden a retirement looks like an option. They’d be able to go play golf and bingo at the age of 66. Spring chickens! As you can see, a relatively small change has a massive result. This is due a double effect. When you save more, it also means you’re currently living on less money every month, therefore your 300 x total spending is also a far lower number. All this combines to drastically reduce the amount of time needed to reach your target amount. For those of you wondering how the calculator gets those numbers, it’s quite simple. Firstly it assumes you’ll be drawing down 4% of your total every year, but it also assumes you’ll be earning inflation + 5% on your investments. This is a relatively conservative number. The global average is inflation + 6.8%. Some say that emerging markets should return more, but in this calculator I erred on the low end, to allow for fees and taxes. So that’s the magical rule of 300. It works both ways too. Either you can retire today and spend one 300th of your investments every month, or take what you spend today, and multiply by 300 to give yourself a goal to aim for. You can also look at individual expenses. 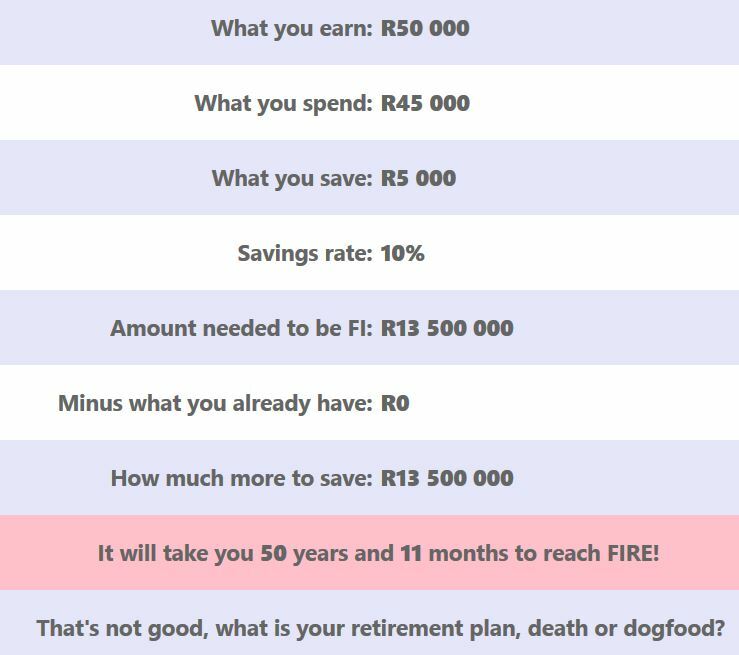 If you decide you want to keep your R500 a month gym membership post retirement, you need to save R150 000 to cover it. If you plan on spending your days playing golf post retirement, with membership fees at R1500 a month, you’ll need R450k set aside to cover those. Please give the calculator a try, I’d love to hear if it is in line with what your expectations are. And as for you Mr Anonymous above, when you can’t get by on a salary of multi-millions a year, you’re clearly never going to be able to cover your costs post retirement. Don’t stress too much though, because apparently there is a process underway to give you free accommodation, food and clothing for many years. You don’t happen to like orange by any chance? How does the new calculator compare with your expectations? Tagged calculator, financial independence, FIRE, rule of 300. Bookmark the permalink.